Everyone who reads this blog (both of you) knows that I’m a fan of the Ignition Casino Thousandaire Maker tournaments. I had the opportunity the other day to play most of my time in the tournament along with poker celebrity and renowned nit Carlos Welch. Despite the anonymous play on the tables at Ignition, Carlos posted the screen shot above so I knew his player number in the game (which is assigned in the order of sign-up). I only lasted 81 hands total, but because I was at the same table as Carlos and Ignition’s hand histories (released 24 hours after the tournament ends) include folded hands, you can get a small peek at the mind of the master at work. I started the tournament as Player 9, and we were six-handed for the first eight hands of the tournament as other players joined up. By the time Carlos joined our table on hand 13 (as the result of table balancing when a third table was created), we’d been up to nine players, but were back down to six. Carlos (Player 13) came in with almost a full starting stack of 2,500; I’d already been up to 2,800, then lost 900 on a draw to Broadway and the second nut flush (neither of which came in) in the previous hand. Carlos folded 3♠2♦ to a raise, on the button his first hand at the table. On his small blind, we were eight-handed and UTG (full stack and on his third hand) raised with 5♣7♣. The button called with 5♦A♦, Carlos folded K♠9♦ and the board ran out with UTG betting every street and shoving on the river with three cards to a flush and Broadway on the board. The button called and they chopped 60 chips. Four hands later, Carlos was HJ with J♥Q♣ and a stack of 2,400. There were seven players and UTG1 raised 8♥7♠, with Carlos colding and SB calling with K♦T♦. The flop was Q♦7♦K♣, about as good as SB could ask for. He check-called an 8bb c-bet. The 7♣ on the turn flipped the script, but SB check-called a 12bb bet, leaving him about 40bb. The river 8♣ completed UTG1’s full house but SB couldn’t get away from the top pair and called off another 24bb. At this point, Carlos’s fortunes and mine hadn’t changed much. He had 60bb (2,400) and I was down to a little under 45bb. Another three hands and I have 2♣2♥ in CO. Carlos is BB with K♣Q♥. UTG1 raised A♦K♦ to 140, I set-mined, and both blinds came along (K♠3♥ for SB). The flop was J♥2♠9♥ and with position I bet 250 after three checks. The 420 chips I won made a nice boost. The next hand, Carlos had 5♦5♥ in SB. UTG opened to 140, getting a call from 7♣4♣ (Player 17 on the button, with almost 72bb at the new 30/60 level). Carlos folded his pair. The flop came 8♥2♠4♠ and UTG bet 210 on the overpair, getting a call. UTG (Player 14) continued for another 410 on the 6♦ turn, then check-snap-called all in on the T♥ river. 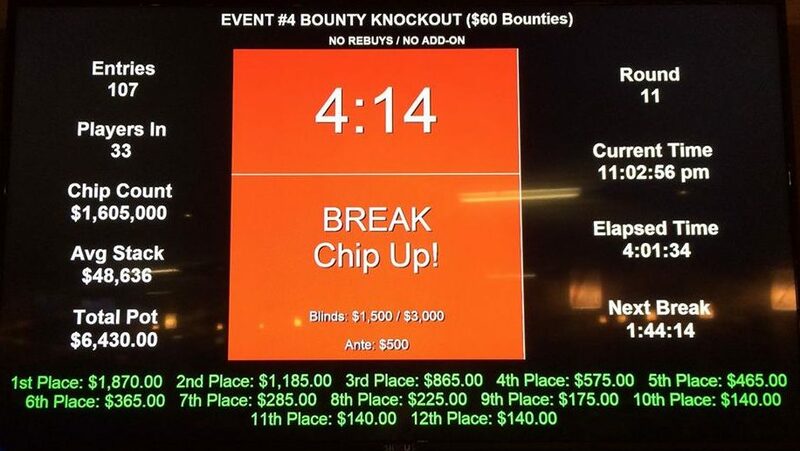 The two players essentially swapped chip counts. Carlos had been at the table for about 25 minutes and we were in essentially in the same boat when he had his first big break. Blinds were 40/80, I had 1,930 and Carlos was down to 2,140. There were a couple stacks at the table in the 5K range, but everyone else was between 1,700 and 2,500. Carlos min-raised with K♣K♦ UTG and got called by BB with T♦9♥. BB donk-bet 360 on the 4♥J♥9♠ flop. Carlos just called. The turn was 7♥ and BB lead all-in for a bit more than Carlos’s stack. Carlos snapped and the river A♣ changed nothing, doubling up Carlos. Forty minutes in, action folded to SB. He limped in with 8♠9♣ and Carlos raised to 5x with Q♠K♦. SB folded. The next hand, I raised Q♦Q♠ 3x and Carlos folded 9♠2♠ from SB. BB folded 2♠K♦. A couple hands later at 50/100, UTG1 raised to more than 11bb (more than half his stack) with A♥K♠. Carlos had 6♦6♠ and was next to act. He folded. Nitty. My 7♥3♥ didn’t look so good; I folded. Carlos had the Mutant Jack (suited ace-jack: A♠J♠) and raised to 300 to take the hand. On the 60th hand I was at the table, he folded 8♥A♦ preflop—actually the best hand of the seven players at the table. I lost my BB to a SB raise with 5♥K♦ (I had 2♦5♦ and only 18bb). On the next hand (with seven players at the table), Carlos opened to 300 from UTG with A♣T♣. BB called with K♣9♣. BB bet 430 on the 2♣4♥9♥ flop and Carlos folded. (I had Q♠5♠ on the button, thanks for asking.) Carlos was still just over the 4,000 mark; I was down to 1,635. I raised A♥Q♥ from UTG1 a few hands later, nobody called the 300, including Carlos on the button with the only other ace: 6♠A♦. UTG1 raised to 250 on the next hand with A♠T♥ and Carlos gave up his 2♥2♠ in CO.
Carlos raised T♥J♣ UTG a few hands later, getting past K♠7♠, A♣3♣, and K♥7♥ in SB. A limp from a middle position player with 9♦T♣ and SB with 6♠T♠ led to a small pot with Carlos involved from BB holding 8♥K♣. The flop of 6♣6♦Q♣ elicited a pot-sized bet from SB, with Carlos and the original raiser folding. Carlos folded his 9♠K♥ in the SB on the next hand, facing a raise from a short stack with Q♣K♣. Next to act after the raise, I folded 3♣A♠. Carlos took a bit of a hit on the button the next hand with J♣9♥. HJ raised with J♠Q♣ and Carlos called 230; it was heads up to the flop of K♣3♠T♥. The raiser check-raised Carlos, who put in 300 on his gut shot, but he folded to the all in bet for more than half his stack. He wasn’t deterred, however, raising 2♦4♦ from CO on the next hand. Was it a spite raise? I don’t know, but it did work. I jammed Q♥8♥ all in from BB against a call from the shorter stack in SB (he had Q♠3♦ and folded). On hand 80, HJ raised 9♦9♣. Carlos folded the Portland Nuts (Q♠T♣). On the button! My time with Carlos ended on the next hand, after a couple of hours of playing with him. I shoved 11bb with Q♥K♠ UTG1 and SB had Q♣A♦. Carlos folded 3♦5♣ in CO, which would have made two pair on the flop: T♦3♠5♦7♠J♥. But he made the $1K payout anyway. Me? I had to wait for another day. 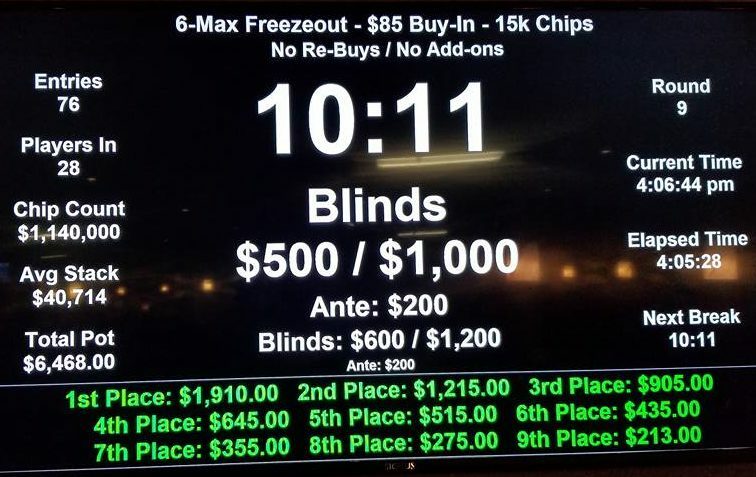 Because of some conflicts in my schedule, I was only able to make a couple of these events (#4 and #8 and no cash in either), but it seemed as if it was a successful series, everything crushed the guarantees (more than double in the $300 Main Event and nearly triple in the Big O). 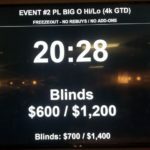 After busting the bounty game, I was able to get into the Big O shootout for an hour and come out even for the night, despite being down to 3bb at one point). Never give up! Never surrender! (All but the last photo courtesy Brian Sarchi and the Facebook NW Poker group). The Pow Wow is back bigly in January (6–21) with sixteen days of events, including a 2-game mix (PLO8 and Something called Pot Limit 5 Card Holdout) and a 4-game mix (PLO, PL Hold’em, PLO8, and PL Hold’em 8 or Better —whaaaaa? ), as well a a $500 buyin $100K GTD Main Event). 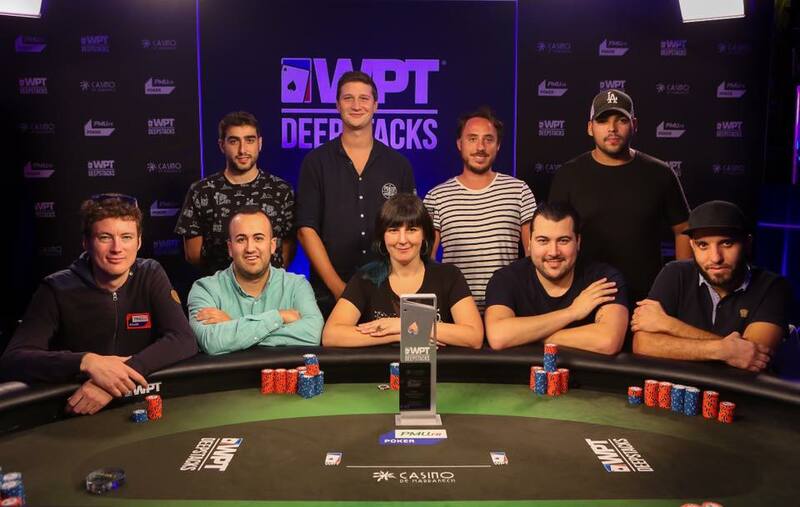 Two big cashes from across the Atlantic this week, following on the heels of Liz Tedder’s run in WPT Deepstacks events in Morocco and Holland. Richard Pittman from Olympia got his first big recorded score at a World Series of Poker International Circuit side event in Rozvadov in the Czech Republic. He took 2nd place in the King’s Big Stack, a €100K ($117.5K) GTD with just a €140 buyin. Pittman was the only US player (out of 95 who made the money) to cash in the event. Brandon Cantu was also in Rozvadov (WSOP Europe started Thursday, just after the Circuit series), and he made it to 14th place in the €1M GTD Circuit Main Event. You have until Saturday (two flights each day) to get into the $500K GTD Main Event at the Liz Flynt Fall Poker Classic in Gardena’s Hustler Casino, with $100K guaranteed to first place. Buyin is $325. 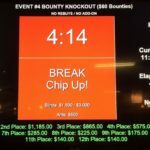 There’s a PLO tournament on Halloween ($235 buyin) and a Bounty Survivor tournament the next day: $235 buyin with $1K for 10% of entrants and $100 bounties. WPTDeepstacks San Diego, at the Ocean’s 11 Casino starts its $200K GTD Main Event ($1,100 buyin) tomorrow, with entry flights on Friday and Saturday, as well. One of the closest stops the WSOPC makes is in Lake Tahoe, and that’s coming up a week from tomorrow. The World Series of Poker Circuit Lake Tahoe starts tomorrow at Harvey’s. There’s a PLO event at 4pm Thursday, 6-Max on Monday, and the $1,675 Main Event begins next Friday. Tahoe is generally one of the smaller Circuit stops, perfect for anyone who’s hunting for a Ring. Tulalip Casino’s Last Sunday of the Month tournament is Sunday at 11am. It’s $330 with $5K added to the prize pool. The Muckleshoot 5th Sunday tournament is at noon Sunday. It’s a $400 buyin with $3K added. Mid-States Poker Tour Denver Poker Open gets satellites going on the day before Halloween and a $100K GTD event kicks things off next Thursday. Monday is also the start of the Venetian Deepstack Extravaganza IV, which runs though Thanksgiving weekend. It features seven events with guarantees in the range of $100K to $400K, as well as PLO, PLO8, Survivor and PLO Bounty tournaments. 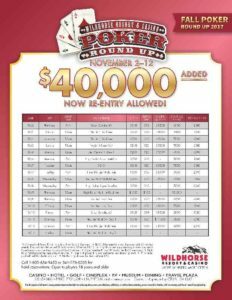 The Wildhorse Fall Poker Round Up has $40K added to the prize pool, starts next Thursday, and runs runs 11 days. The LA Poker Open has 17 days of play at the Commerce Casino starting a week from Friday. 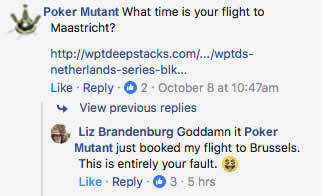 After making the final table in Morocco, Liz Tedder popped up to southern Holland via Brussels to play in the WPTDeepstacks Holland. She made Day 2 but not the money, though she did get a little bit of press on WPT.com for her efforts. She’s home now (after a stopover in Iceland), despite my entreaty to extend the run. Hopefully, I’m not blowing his cover, but one of the guys I worked with during my dalliance with poker reporting last year just moved to town a couple of weeks ago. Folks who’ve played World Series of Poker events may recognize Sam Cosby, and you’re likely to see him at the tables in-between trips to exotic locales like South America, Europe, Oklahoma, and North Carolina. Monday, he even came to the home game I started out at (we both busted before the money). 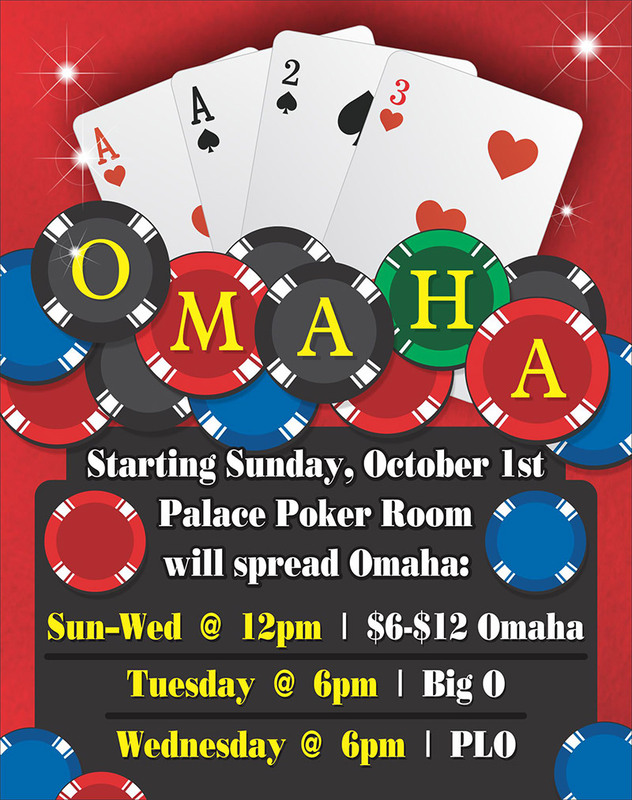 The series starts tomorrow, with a 6-Max tournament at noon, and a Big O tournament at 7pm. All eight tournaments are true freezeouts, with no re-entry, no rebuy, and no addon. I can hardly wait. Episode 4 of the second session of Poker Time is out. I’m not sure if this is the one with Jar Jar Binks. Just a couple of big cashes from established PNW players this week. Tyler Patterson notched 7th place at the Wynn Fall Classic Championship, and Matt Affleck took the first place prize. See the Portland Meadows Freezeout Series info above. 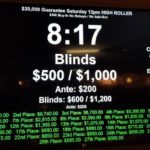 The Bicycle Casino /CardPlayer Poker Tour Big Poker Oktober is in its final days, The big games and mix games are over, but there are a couple of $25Ks and a $50K (and a Survivor) over the next few days. WSOPC Chicago at Horseshoe Hammond Main Event ($1,675 entry with $1M GTD) starts Friday, with a second entry day on Saturday. You can actually still get a non-stop, one-way ticket for Friday as low as $240. Run It Up Reno, at the Peppermill, has been running since Monday. It goes through the weekend and features Omaha Hi-Lo/Stud Hi-Lo 6-Max ($125) on Friday, a $600 entry, $150K GTD NLHE Main Event with starts on Friday and Saturday, $125 entryPLO/Big O with $5K GTD on Saturday, and lots more. If you want to get down there Thursday, start driving or you can take a flight for about $240. That’s the downside of last-minute travel shopping. Their game placards look very nice. Thunder Valley Resort and Casino hosts the Ante Up NorCal Classic this week. There’s a $150K GTD Main Event with entry days on Saturday and Sunday, You can drive there in less than 10 hours if you don’t stop to pee (but you’d miss the Freezeout Series at Portland Meadows). There’s another Venetian Weekend Extravaganza running through Sunday. The Adobe MAX conference is in the Venetian Conference Center, so if you’re in the graphics or document industry, maybe you can get your poker junket paid for…otherwise, at least a couple hundred dollars each way. The DSE IV gets going just a week later. The big event isa $400K GTD with a $1,600 entry (running during the week of the Wildhorse Fall Poker Round Up, naturally. 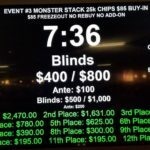 There’s a $500K GTD Main Event at the Liz Flynt Fall Poker Class in Gardena’s Hustler Casino, with $100K guaranteed to first place, but the series starts off with a $325 entry $100K GTD on Saturday and a $50K GTD ($300 buyin) on Sunday. The Main Event flights start Tuesday and run through Saturday; buyin is $325. It’ll be, let’s say—interesting—to see what the fallout is from the nearby Gardens Casino messing with their schedule last month when they fell short of a large guarantee. Direct one-way flights to LAX on Monday are still available for less than $100. The Talking Stick Resort’s Arena Poker Room has its 2017 Arena Fall Classic this weekend. 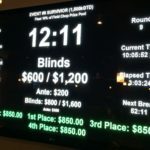 Three events with $200, $300, and $300 buyins and a total expected prize pool of about $120K. WPTDeepstacks San Diego, at the Ocean’s 11 Casino is opening with the $75K GTD Haig Kelegian King of Clubs Classic ($300 with addon) and ending with a $200K GTD Main Event ($1,100). Mid-States Poker Tour Denver Poker Open gets satellites going on the day before Halloween (a week from Monday) and a $100K GTD event kicks things off that Thursday. The Wildhorse Fall Poker Round Up has $40K added to the prize pool, starts 2 November, and runs runs 11 days. The LA Poker Open has 17 days of play at the Commerce Casino starting 3 November..
I’ve played a lot of Turbo tournaments online over the years but I can’t remember ever actually sitting down into a Hyper (Turbo). I play fast enough, but the aggressive speed of the blind structures is far more subject to variance. A couple of weeks back, though, during a Wild Wednesday promotion on Ignition Casino, I jumped in and two-tabled their $12K GTD NLHE 50K Chips Hyper while I was playing my usual $5K GTD NLHE Thousandaire Maker. Ignition’s Hyper games have 3-minute blind levels, meaning two or three hands at the most at each level; between three and four levels per circuit of the table. It’s already level 2! 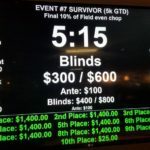 UTG raises A♦3♦ to 400 and UTG2 calls with 9♠9♥. I three-bet to 960 and both of the others call. We flop T♠J♠9♣, I check, UTG2 checks, and UTG2 bets abut half-pot (1,640) on his set. I call. 8♥ turn is a great card for me. I check again, UTG2 bets 3,120 and I call. The river is 5♠, I bet 6,000 and he calls with the set. So I’m off to a pretty good start. I’ve got about 9K more than any of the other players at the table, but nobody’s down below 40K yet, even though a couple of levels have gone by already. I open to 600, the big blind calls with 3♥2♥. The flop is A♦J♦Q♥ and I misclick, betting just 200 instead of my more typical half-pot. It must look fishy, because he calls. The turn is Q♦, and he check-folds to another bet of 800. Another hand, another level! I’ve been bounced to a new table, though I’ve got the chip lead here, too. UTG2 has J♣J♦ and opens to 1K. SB calls with T♥7♦ and I come along. The flop is 9♣3♦8♦. SB and I check, UTG2 bets 1,720, SB has an open-ended straight draw and calls. I dump the hand and they both check to the river after an ace hits the turn, with the jacks holding out. Blinds are moving up rapidly; I’ve gone from more than 300bb to 60bb in 15 minutes and I haven’t even really lost much in the way of chips. UTG3 opens Q♥Q♦ to 3K, getting called by the button 7♦A♣ and both of us in the blinds (BB has K♦5♥). The flop is 9♣4♠7♣ and UTG3 makes a bet of 9,900 getting folds from the rest of us. UTG calls with 8♥K♥, HJ raises to 6K K♣Q♦, the button calls with A♣9♥, and I defend my low pair, followed by a call from the limper. I fold after a c-bet of 7,700 on the flop of K♠A♠8♦ from the original raiser and a call from the button, then UTG jams his bottom two pair and wins the pot. Wow. Playing two hands in the same level! HJ min-raises with T♣7♠ and I call. Both the small and big blinds (K♣T♠ and K♠[jd[,][respectively)][come][along. ][It’s][a][Q♦9♣8♦ flop and HJ bets 8K for his open-ended draw. I just call, but both the blinds fold. The turn is 2♥. HJ checks this time, I overbet the pot with an all in, and HJ puts another 36K in with his draw. He misses with the 3♦ on the river, and I more than double. UTG1 raises to 9K with J♦J♥, I defend, then check-fold to a 14K c-bet when the flop is 2♠2♥4♠. Action folds to me and I just call with a hand I’d usually raise with, particularly since BB has about a third of my stack. The flop is 4♦5♥7♦ and I check fold when BB jams the remaining 29K into the pot with 4♣Q♦. He is ahead, but I wouldn’t be loving it if it was me. I raise to 15K and everyone folds. I pick up more than 10K. Everyone folds. Nobody has less than 10bb, but that changes so fast in hyper. HJ min-raises with A♠8♥. I call and so do both the blinds (5♦5♥ for SB and 6♣9♦ for BB). The flop is Q♦Q♠7♦, it checks to me and I bet about half-pot. Everyone folds. I raise the Portland Nuts to 21K and everyone folds. I’m the only player on the table with more than 80K. UTG limps in with K♥A♥, SB is along with A♦4♠, and I check. We all check a flop of 6♣7♠6♦, then I chack call ona 16K bet from UTG when the turn is 9♥ (SB folds). We check the 3♣ river and my top pair holds for a tidy result. I’m not sure why I didn’t call the jam from UTG (51K with 9♠K♥), but it’s probably because SB at the time had close to 150K and I didn’t want to get squeezed or called with this particular hand. This hand momentarily put me in the top 20 players in the tournament, with about 100 remaining. Action just folded to SB, who limped his K♦K♣. I raised to 40K, he went all in for a total of 123K, and I decided to call. The board ran 9♥2♣T♥A♣4♦ and he cracked in 90th place. Three players at the table are under 50K (one has just a big blind remaining), then there are another three in the 150K to 200K range. And there’s me, but even I’ve only got 50bb. UTG goes all in with A♥4♥ and just 23K. I call, and BB—one of the mid-range stacks—calls with 5♥8♥. The flop is auspicious but the board is 2♣2♠8♠Q♣4♦ by the river, and the all-in wins. I raise to 48K and CO goes all in for just 4K more. I call, he shows Q♠J♠, and the board runs out 8♠K♣A♣2♥4♣; the wrong color black for him, fortunately. We’re down to 70 players. I don’t know why I fold this hand here under the gun. 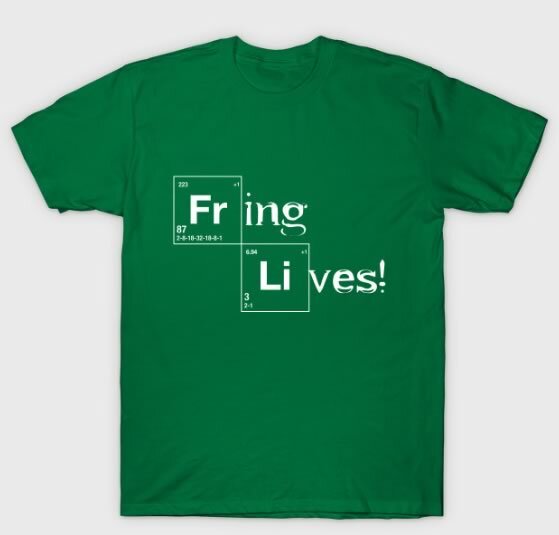 In any case, It’s a mistake, although it may have cost me less. The fold may also have cost me more. One of the short stacks in CO goes all in with 8♦Q♥ and 62K. I definitely would have called that if I’d raised to my standard 30K here. The tricky decision would have been when SB went all in with A♥K♣ and 157K. Would I have called another 95K even with the Portland Nuts? If I had, I would have been nicely-rewarded, because the board was T♠K♥5♣4♠T♥. SB won with two pair, but my trips would have picked up a pot of 250K. My first actual setback for a while. I raise to 75K, CO is all in for just 16.5K with T♦Q♥ and BB calls with A♥8♣ from a stack about equal to mine. We check it down to the river with 2♠7♠2♥Q♠8♣ on the board, the short stack quintuples with two pair and BB get the side with a better kicker. 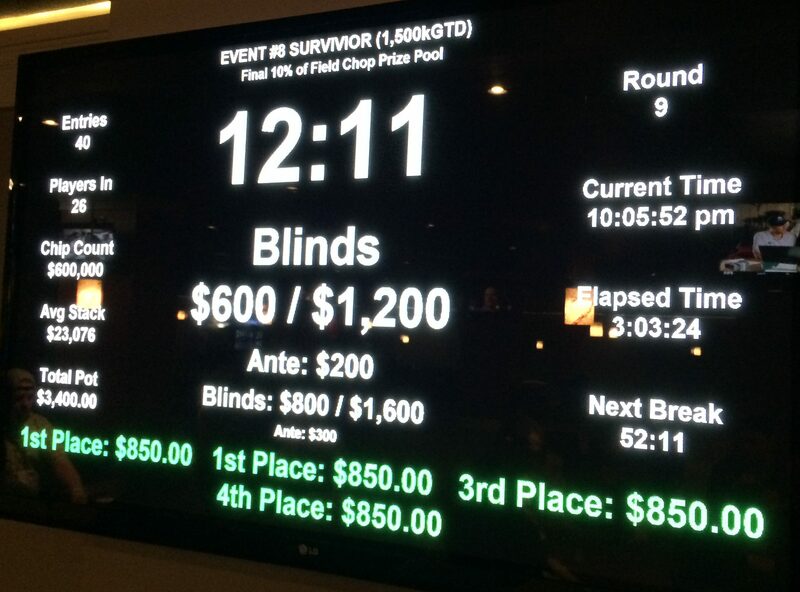 Yeah, you read that right: 12 hands and the big blind has gone from 25K to 60K! Worse, just after the last hand I wrote up, I was in the big blind, got moved to UTG at another table, and had to pay another big blind, so even though I was only down to 225K after the loss, I’ve lost another 115K just from blinds and antes in 10 hands. The ABC of Hyper: Always Be Chippin’. Anyway, I’m under 2BB here, we’re in the money, I’ve got suited connectors even if they’re crappy suited connectors. I’ll barely be able to pay the small blind and ante if I fold. UTG2 is all in for 176K with J♠J♣, CO is the tournament chip leader with 810K and shoves with 6♣6♦, and I’m all in with my last 41K. The flop is 4♠K♣K♦, so there’s almost hope, but the Q♦ turn and 9♥ river give the chips to the best hand and I’m out in 41st. 90 hands. 90 minutes, +58% ROI. For some of us, part of the allure of poker is the potential of going someplace more exotic than Las Vegas, funding our travel with our winnings or at least giving us an excuse to go somewhere, whether that’s a poker cruise or, in my case, Dublin or Prague (still working on those). Newberg’s Liz Tedder (Brandenburg) took a little trip to Morocco for some sun and surf, plus a little poker at the WPTDeepstacks Marrakech, where she did more than just add a couple of new flags to her long list of US cashes at Hendon Mob. She min-cashed a preliminary tournament, then went on to the final table of the Main Event, the only US player to cash in the field of 433 mostly-European entrants. Up over a million chips near the beginning of Day 3 (Sunday) with just 16 players left, Liz had a bit of a setback when her kings were cracked, but she held on through three more hours, to make it to ninth place. You can watch the WPT stream of the final table on Twitch, and if you don’t mind listening to French commentary, Liz is on much of the Day 3 coverage from co-sponsor PMU. All aboard the train plane. 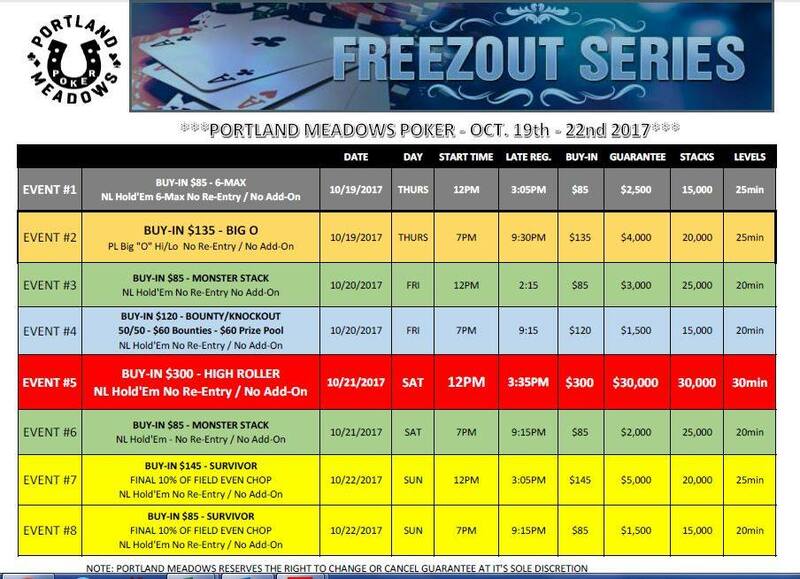 Announced just after last week’s Planner went up, Portland Meadows has four days of freezeouts beginning next Thursday, with a 6-Max and Big O. There’s a Bounty tournament (with half the buyin going toward the bounty) and a $300 entry High Roller, plus two Survivor tournaments to cap things off (it’s not explicit on the announcement, but a $145 entry Survivor will pay about $1,450 to 10% of the entries, depending on how the 10% is rounded). You know i love a Survivor. It seems like good poker-related news is hard to find sometimes, but the Southern Oregon poker community came together Sunday at Southern Oregon Poker Club in Medford to raise money for Dustin Ferreira, who needs a new wheelchair and an accessible van. More episodes from Grant and Jonathan. 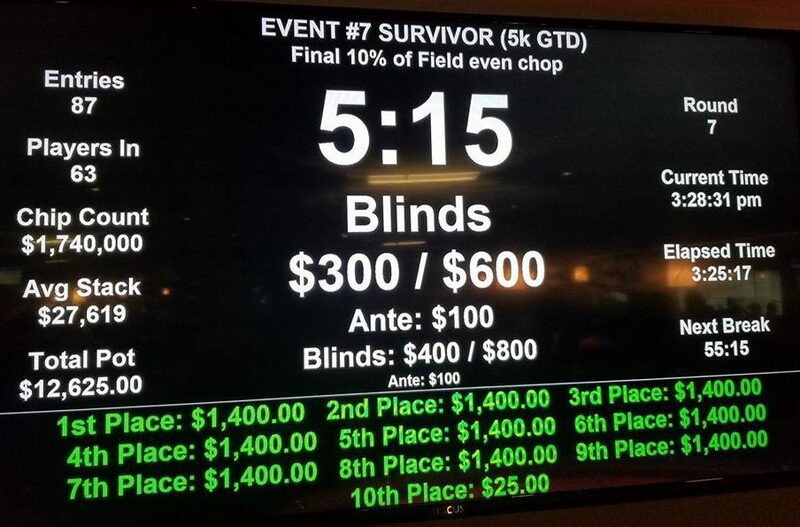 They didn’t get a full bracket at last weekend’s planned $500 entry 8-player HU challenge at The Game, but Daniel Ross posted the bracket from the 6 entries. 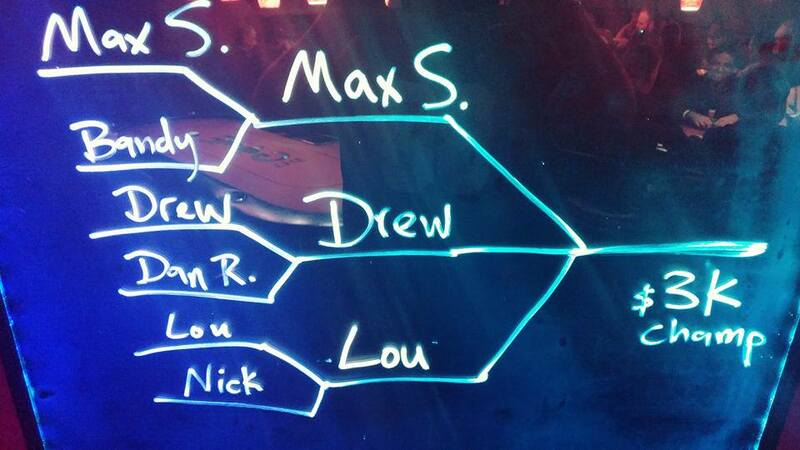 Players went 3-handed after the first round and battled it out for all the money. Scott Clements won first place in the $600 $150K GTD Wynn tournament last week, making him the week’s winner in overall dollars and for a single cash, with Kevin MacPhee weighting the table heavily in the Northwest’s favor with a fourth-place finish. Gennadiy Dvosis (Bellevue) was another player on the leader board who picked up some big bucks with a 3rd place in the Muckleshoot Main Event, along with Nicholas Halvorsen of Vaughn, Washington. Dan “Goofy” Beecher made two final tables during the Muckleshoot series (with three cashes overall). And, of course, rounding out the big money, the aforementioned Liz Tedder rounded out the top-scoring returning players. 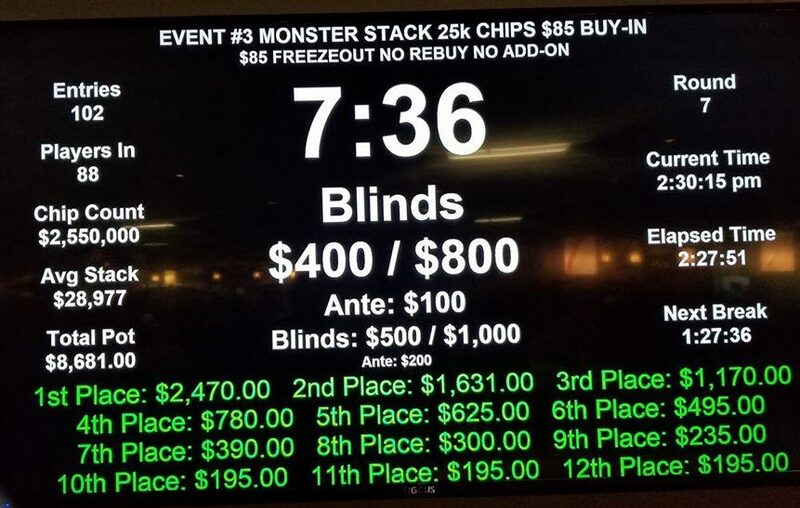 Side note: I mentioned last week that there was a ghost entry on Hendon Mob for Joe Brandenburg (as “Joe Bradenburg”); those cashes were consolidated into the right entry and make Joe one of the bigger winners of the week by themselves! Nothing special this week, but see the Portland Meadows Freezeout Series coming up a week from Thursday. The Bicycle Casino/Card Player Poker Tour V Big Poker Oktober continues this weekend with a 2-entry day ($1100) $400K GTD. Entry days Saturday through Monday. They have a $10K GTD PLO tournament coming up on Wednesday. The Heartland Poker Tour Kansas City Main Event has three entry days ($1650) starting tomorrow. WSOPC Chicago at Horseshoe Hammond kicks off with a $500K GTD $365 entry Ring event with three entry days (4 flights) Thursday through Saturday. There’s also a $580 PLO tournament there on Sunday. Monday is the start of Run It Up Reno, at the Peppermill. They start with 6-Max PLO ($150), 6-Max HORSE ($150), and 8-Game 8-Max ($235). The always-buys Thunder Valley Resort and Casino hosts the Ante Up NorCal Classic starting next Tuesday. There’s a $150K GTD Main Event, $10K GTD O8, and a couple of other goodies on the menu. There’s another Venetian Weekend Extravaganza (also beginning Tuesday), with the big event a $340 buyin $100K GTD. If you want to follow in Liz Tedder’s footsteps (sort of), get your surf and poker at WPTDeepstacks San Diego, at the Ocean’s 11 Casino, opening with the $75K GTD Haig Kelegian King of Clubs Classic ($300 with addon) and ending with a $200K GTD Main Event ($1100). However, we are now less than a month from the start of the biggest poker tournament series in the Pacific Northwest, the Fall Poker Round Up at Wildhorse Resort & Casino, a few miles east of Pendleton proper. 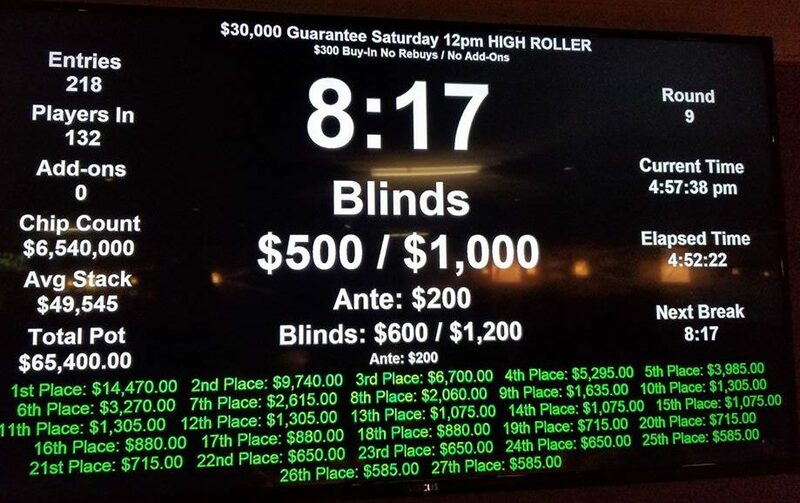 Running a week-and-a-half, and with a total of $40K added to the prize pools, there are 12 events ranging from $125 (including dealer add-on) turbos and a High Roller with an $1,100 buyin, along with two satellites each into the High Roller and the $550 buyin Main Event. Bucking a trend toward freezeout formats, Wildhorse has begun allowing re-entry over the past couple of years, along with expanding their entry period beyond the first level (any number of players delayed on the freeway for more than a half hour or just used to late entry found themselves at a loss when they got to the casino after close of registration) Not a problem now! The schedule for this year is practically identical to previous years, with the sad exception of the Tuesday HORSE tournament. It’s been replaced by a Big O tournament which may pull in more than the 122 entries HORSE brought in each of the past two falls, but it’s a downer to see one of the few mixed-game tournaments in the Northwest dissipate. Rooms on the weekends at Wildhorse are already scarce, though so far there seems to be plenty of stock in town—great if you don’t mind the commute, though it can get a bit wearying at the end of a long poker day. I’ve never managed to cash at Wildhorse, but I’m planning to be out there for the whole run this time around and turn that around. A few years ago, I won a Main Event seat at Portland Players Club and was all excited until I woke up in the morning to a call that my wife had a heart attack at her sister’s house that morning; last year I didn’t make it out because a tree branch fell on my convertible roof the day after the election. So it’s time to get this monkey off my back. Poker journalist Jen Newell is the latest to spread the word on the attempt by the Oregon Lottery to shut down the Portland Meadows with a piece at poker room, Legal US Poker News. While there’s not much new there for anyone who’s been following the saga, it does have a bit more depth and history than most. And I certainly can’t fault her use of a photo that’s actually from Portland Meadows (not to mention tweets from myself and Brian Sarchi). The poker fundraiser for Medford’s Dustin Ferriera is Sunday at 2pm at Southern Oregon Poker Club. Dustin co-founded a wheelchair basketball team but was hit by a truck in a crosswalk earlier this year and the fundraiser is helping to raise money for a new wheelchair and a van. 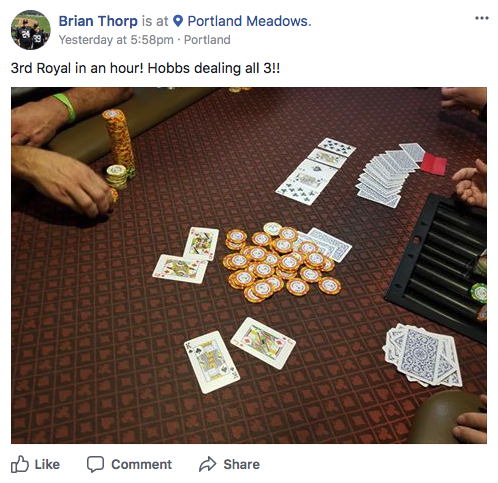 According to a post by Erica Sheff on the NW Poker Facebook group, there was some sort of 2am game at the Heathman Hotel Saturday night, but no info on whether it’s going to be a regular thing. The game at the Rialto has moved from 0.5/1 to 1/1 with a $300 max buyin, again according to a NW Poker post (from Sean Dalton). If 0.50/1 is still your thing, Room 52 on the east side will accommodate; according to those in the know, the chairs are quite comfortable. 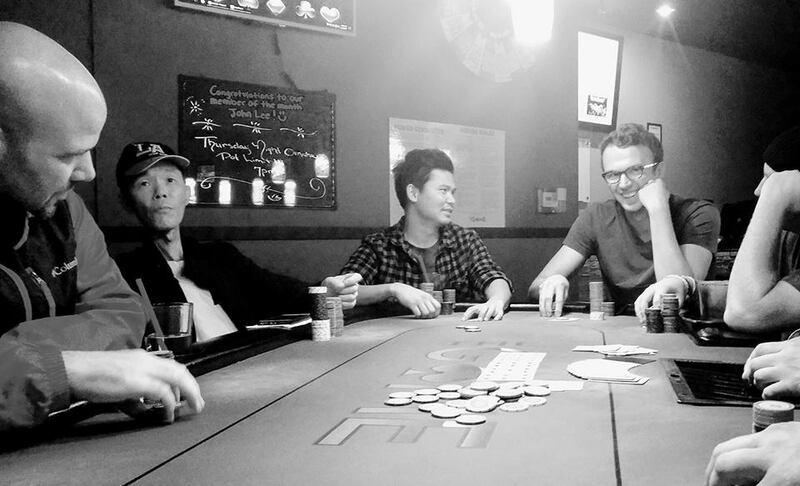 Another thread on NW Poker was getting an 8-person NLHE Heads-Up tournament together this weekend at The Game. Likely all the seats are snapped up by now, but message Daniel Ross to verify. Palace Casino (or is it Chips?) 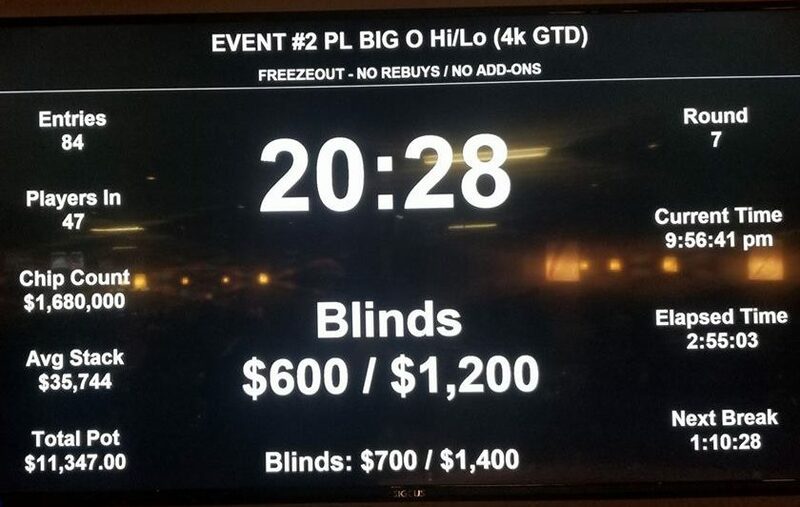 in Lakewood (just south of Tacoma) has announced they’re going to be running 6/12 Omaha starting at noon Sunday through Wednesday, with Big O (1/3, 5 bringin, pot limit) after 6pm on Tuesdays and PLO after 6 on Wednesday. Folks are already planning for next year’s WSOP Main Event, and satellites to the big game are running in a variety of places outside the state. Every Sunday at the Wild Goose Casino in Ellensburg, Washington, you can play a $45 tournament where $20 goes into the prize pool and $20 goes into a satellite pool ($5 to the house). The winner of each weekly event gets to play in the final next May, with the top prize there getting a Main Event Seat and $1K in travel expenses. Off the other direction at Lemoore, California’s Tachi Palace, this weekend is the first of eight monthly satellites with a $225 (no re-entry) buyin and a Main Event seat with $2K in travel costs guaranteed to first place. First Saturday of every month through May. For the love of all that is holy, follow @ArtySmokesPS. Lots of action from the Chinook Winds Fall Coast Classic as the numbers got assimilated into the rankings this weekend. Fist, congratulations to Paul Whitner of Goldendale, whose first cash (2nd place in the Main Event) on Hendon Mob moved him into the top 500 on the Washington All Time Money List. Brian Bowman of Portland has only three reported cashes, but two of them are from final tables at Chinook Winds Main Events. Randall Pefferle of Bend (Main Event, 5th) and Brent Schott (Gervais, Main Event, 8th) were others who made their first cash in a big way. Toma Barber showed up on the radar ($3K minimum) for the first time because his pre-2016 recorded cashes are under a separate account for Arizona. Always a good idea to keep an eye on your cashes (for instance, I’m pretty sure Joe Bradenburg from Portland is actually Joe Brandenburg). Both of them have more recorded earnings than I do. Happy belated birthday, Joe! The big winner was, of course, Binh “Jimmy” Nguyen, whose win in the Main Event moved him from 33rd in the Oregon All Time ranks to 29th. Dave Tragethon‘s 3rd place finish moved him all the way from 833rd to 249th, the biggest move in absolute numbers as well as percentage improvement. Glenn Larson was another big mover, though not as a result of anything at Chinook Winds; he took 7th place in the WSOP Circuit Main Event at Thunder Valley, which was good for a move from 700th to 322nd on the Washington money list. Back at Chinook, Eunhee Kim Chan jumped 128 places to 284th with two final tables (winning the Rattlesnake Boss Bounty and 4th in the 6-Max). 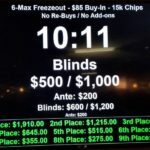 Brad Press was in a deal made at the next-to-last tournament final table and took home enough to move up to 176th from 198th on the Oregon money list. Eugene’s Beach Poker Club Check out their Facebook postis celebrating their first anniversary on Friday with a party at 7pm. Oh, and there’s poker. for info on how to get extra chips. It’s the first week of the month and that should mean a $20K guarantee First Friday at Final Table. The Wynn Fall Classic $500K GTD is this weekend with a $1,600 buyin. At Deepstacks Poker Tour Battle of Alberta in Calgary, there’s a NLHE PLO mix game (C$330 buyin) Thursday at 2pm. Their C$2K buyin C$500K GTD Main Event starts Friday. The Stones $250K Fall Classic is running at Stones Gambling Hall and its $150K GTD Main Event (450 buyin) has entry days Thursday, Friday, and Saturday. The Bicycle Casino/Card Player Poker Tour V Big Poker Oktober started this week, and this weekend features a $245 buyin $400K GTD with six flights from Thursday through Saturday (11am and 4pm each day). 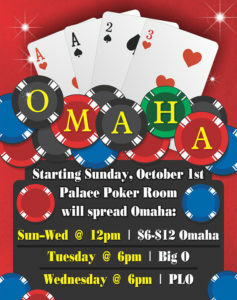 There’s a $10K Limit O8/Big O game on Monday at 1pm. The RealGrinders poker group at the Venetian has Big O on Friday, O8 on Saturday, and a $300 NLHE Main Event on Sunday. Heartland Poker Tour Kansas City, is at the Ameristar Thursday. Four $365 entry flights over three days to a $500K GTD tournament open the WSOPC Chicago at Horseshoe Hammond starting next Thursday. A week from Monday is the start of Run It Up Reno, at the Peppermill. They’ve got HORSE! The always-buys Thunder Valley Resort and Casino hosts the Ante Up NorCal Classic from 16–22 October. There’s a $150K GTD Main Event, $10K GTD O8, and a couple of other goodies on the menu. There’s another Venetian Weekend Extravaganza from 16–22 October, with the big event a $340 buyin $100K GTD.